Quickly resolve Wi-Fi bandwidth issues and reduce downtime. Drag and drop Wi-Fi performance metrics for immediate visual correlation across all of your network data. View performance, traffic, and configuration details of devices and apps on-premises, in the cloud, or across hybrid environments with the NetPath™ feature. Wi-Fi packet capture is critical to help ensure business service delivery. Multi-vendor network infrastructure monitoring tools will help reduce downtime, increase employee productivity, and improve ROI. SolarWinds Network Performance Monitor (NPM) delivers wireless network monitoring and Wi-Fi sniffer management that retrieves performance metrics for autonomous access points, wireless controllers, and clients. It also offers fault, performance, and network availability monitoring, cross-stack network data correlation, hop-by-hop network path analysis, and much more. 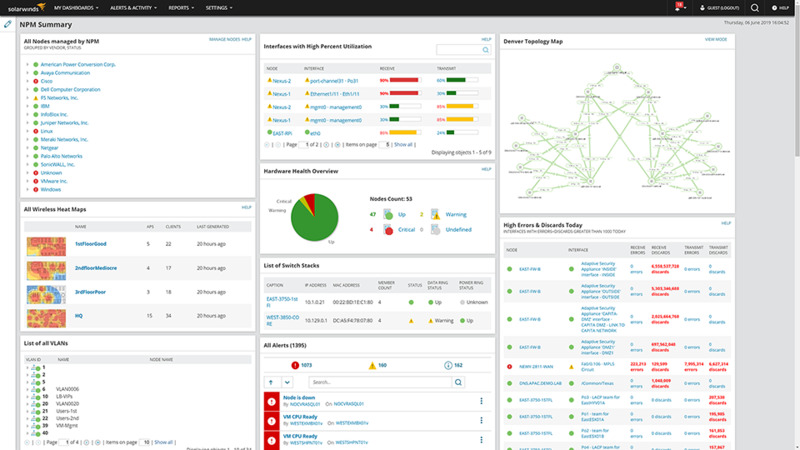 SolarWinds NPM offers customizable topology and dependency-aware intelligent network monitoring alerts. Quickly detect, diagnose, and resolve network performance issues on customizable web performance dashboards. Automatically discover and map devices capture performance metrics and link utilization, and view wireless coverage with a Wi-Fi network sniffer tool, so that you are able to troubleshoot issues before they affect client networks and your business. Get deeper visibility into critical network firewalls and load balancers. Network Insight™ for Cisco ASA and F5 BIG-IP simplifies the management of complex network devices. When your Wi-Fi network is frequently slow or down, it diminishes productivity, reduces ROI, and jeopardizes business growth. By not using the right Wi-Fi packet sniffer tools to detect network issues before they occur, you waste time, money, and resources. Network admins need to be able to see outside of their own network Wi-Fi infrastructure to identify external network connectivity issues.